Best Buy and Kohl's may not be very exciting, but they offer plenty of value for investors. Investing in brick-and-mortar retail during the age of e-commerce may seem foolish, but be careful not to throw out the baby with the bathwater. The retail landscape has already changed dramatically, due in no small part to Amazon.com, and more change is inevitable. While some retailers won't survive, others will thrive as they transform themselves to better compete. While there are plenty of retailers that I wouldn't touch with a 10-foot pole, Best Buy (NYSE:BBY) and Kohl's (NYSE:KSS) are a different story. Best Buy's turnaround, which has played out over the past few years, has so far been a success. The consumer electronics retailer slashed costs by removing layers of management and making its operations more efficient. At the same time they have been improving customer service by increasing customer-facing labor and providing additional training. Prices were cut, the e-commerce business was built out, and initiatives like ship-from-store greatly improved both product availability and shipping times. Best Buy is currently facing a difficult retail environment. Consumer electronics sales, as tracked by NPD, are slumping, and weak sales of smartphones during the holiday season led to a comparable-store sales decline. But Best Buy is gaining market share, and with further cost cuts planned, earnings can continue to grow despite weak sales. During 2015, Best Buy generated $2.78 per share in non-GAAP earnings, with the biggest adjustment being restructuring charges. With a stock price around $31, this puts Best Buy's P/E ratio at just about 11. This ignores the strong balance sheet that Best Buy has built up over the past few years, with $3.3 billion in cash and just $1.7 billion in debt. This money is being used to fund a $1 billion share buyback program announced in February, which has the potential to reduce the share count substantially. With a solid balance sheet, plenty of cash flow, and a major e-commerce drive, Best Buy is a retail stock to own. Department store Kohl's (NYSE:KSS) has struggled to grow sales over the past few years. Comparable-store sales barely grew at all during the fourth quarter, up just 0.4%, while net income plunged 20%. The company's turnaround strategy is called the Greatness Agenda, and while there has been some progress, like the roll-out of a new rewards program, investors aren't pleased. Shares of Kohl's are down about 43% over the past year. Despite the problems facing Kohl's, I feel the retailer is a buy because pessimism has grown too strong. Even with a rough holiday season last year, the company generated nearly $800 million of free cash flow, putting the current market capitalization at about 10.5 times this number. Kohl's is a very active buyer of its own shares, buying back over $1 billion worth in 2015 alone, and with the stock price depressed, the share count can fall rapidly going forward. 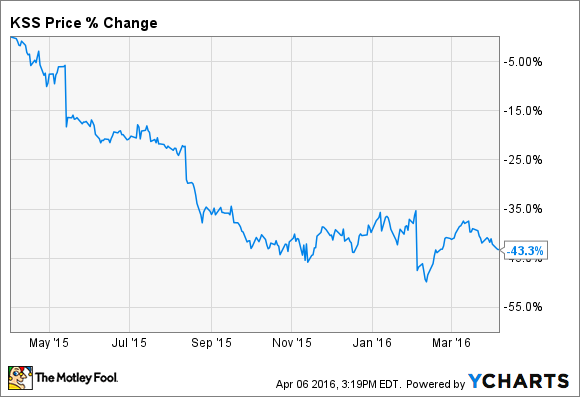 While investors wait for Kohl's to right the ship, the company pays a generous dividend. The stock currently yields nearly 4.5%, following a dividend hike earlier this year. Based on last year's free cash flow, the payout ratio is about 48%. Therefore Kohl's has room to suffer from further earnings declines before the dividend would truly be in danger. Neither Best Buy nor Kohl's are growth stocks, but both generate plenty of cash, and both trade at attractive valuations. Best Buy is the only nationwide consumer electronics retailer left standing. Its focus on superior customer service and hands-on advice, along with competitive prices, should help drive its turnaround efforts forward. Kohl's has more work to do, and there's a chance that the department store model won't stand the test of time. But the stock is cheap, and for the value investors among us, it's certainly worth a look.